HG's 2011 Fro Yo Survival Guide! Check the store's website for nutritional stats -- that way you can go in prepared with a game plan. If you find yourself at a yogurt shop and you didn't get a chance to do the research, ask the peeps behind the counter if they have nutritional info handy -- sometimes the stores do have it, even if it's not on display. Pssst... Click on these store names for a shortcut to nutritionals town: Pinkberry, Red Mango, TCBY, Menchie's, and Tasti D-Lite. Serving sizes can be deceiving. The serving size listed with the stats is usually much smaller than what ends up in your cup. While 1/2 cup is a typical amount listed with calorie counts, when was the last time you had 8 measly tablespoons of fro yo? (Yup, 8 tbsp. = 1/2 cup.) Even if you order your yogurt in a 4-oz. cup, you can bet your brownie bites there's up to 8 ounces of yogurt piled into it. Just think about that towering swirl extending out of the cup! If you're looking at nutritional info, get ready to do some multiplication. Some yogurt shops offer a TON of different flavors on any given day. Don't get overwhelmed, but make sure you know what you're getting. A store might boast 10-calories-per-ounce options yet also serve choices with 30+ calories an ounce. It's sometimes fun to mix a few of the very low-cal flavors with some of the more decadent ones. That can help keep calorie counts down when you want to indulge a little. The calories from toppings add up fast. This is where you REALLY need to be careful. It doesn't matter if your fro yo has only 8 calories an ounce -- if you load it up with candy and fudge, it can easily amount to a ton of calories by the time you're done. So heap on the fresh fruit (always a good option), scoop on some mini marshmallows (just 2 calories each), and finish it off with a low-calorie topper like a few crushed cone pieces, some sprinkles (only about 20 calories per teaspoon), or a bit of sweet cereal. Watch out for deceptive toppers! You probably know to limit the hot fudge, cookie dough, and crushed candy bars. But watch out for these seemingly innocent, yet fattening items: fruit in sugary syrup (opt for fresh), sugar-free syrups and fudge toppings (they can still be loaded with calories and fat), fat-free brownie bites (can still be crazy-caloric, even if they pack no fat), and granola (easily adds 100 calories per 1/4-cup scoop!). People, this is an EXCELLENT example of what a huge question mark customizable desserts can be. You pick your flavor, you pick your toppings, and the TCBY peeps mix it up for you. Is your dessert closer to 530 or 1,850 calories? Does it have under 10 grams of fat or over 80? Only you can determine that. (And the person scooping the toppings, of course.) So don't fool yourself into thinking that a huge heap of Peanut Butter fro yo loaded with walnuts in syrup and hot fudge toppings is on the low end... It isn't! Pass this email on to all your fro-yo-loving pals -- click "Send to a Friend" to keep them informed! Today, June 24th, is National Pralines Day. 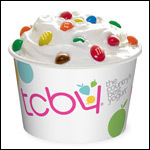 In keeping with today's theme, we suggest celebrating with a scoop of Praline & Cream frozen yogurt from TCBY!